You know,WordPress is one of top blogging platforms for millions of blogs.Most of People use search engines to find contents of their choice.That is why,we need to create search engine friendly blogs while blogging.Then, people are able to find them in search engine for targeted terms. However,WordPress has a lot of SEO plugins to help you in making your blogs search engine friendly. But, You cannot use all WordPress SEO plugins in one site.We have to select to go for best only that are really effective to the blog.So, if you are using right plugins with other search engine optimization techniques, you will be enjoy with a lot of traffic on your blog from search engines.There are more WordPress SEO plugins are available for free, but there are some plugin for which we need to pay some money before using them. Most WordPress features work pretty well out of the box, and that is probably why it is the most popular content management system on the planet.However, site owners usually need to work with WordPress to optimize their site for speed and search engine optimization. 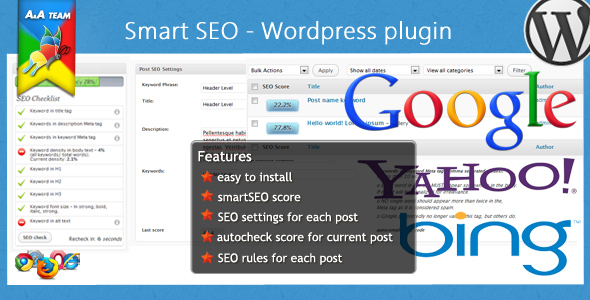 Smart SEO Plugin, The easiest way to optimize your WordPress website for search engines! 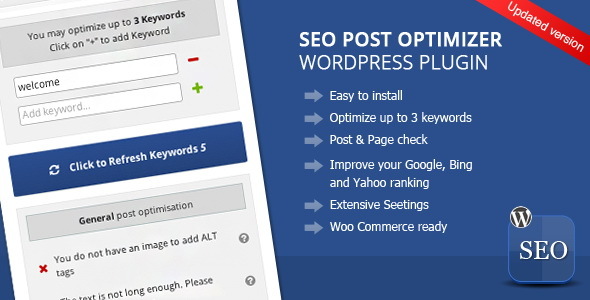 SEO Post Optimizer plugin you can easily optimize your posts and pages in WordPress for search engines. It checks important SEO criteria. Onpage SEO is very important as all experts agree. Especially after panda and penguin updates it is very important to optimize your page without over-optimizing! Welcome to SEO Studio. 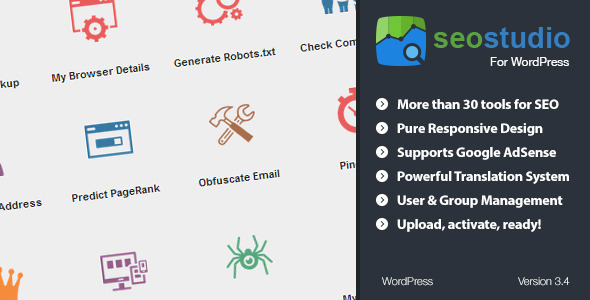 This is a complete set of over 30 tools that you can use to offer your clients SEO services, or to use it on your own website(s). The application runs on WordPress and has no installation wizard. Simply upload, activate, and you’re ready to go. 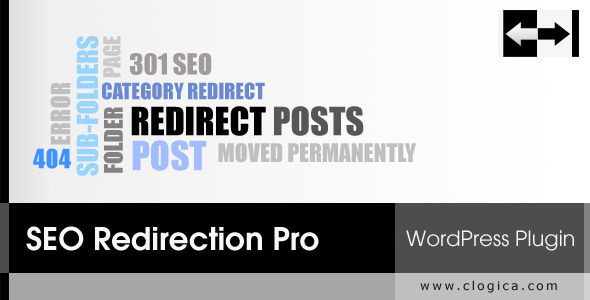 SEO redirection pro is a WordPress plugin designed to help you controlling all site redirects, as you know, redirects play an important role for enhancing SEO. 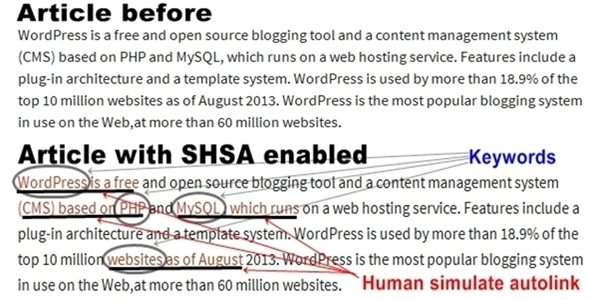 Seo Human Simulate Autolink (SHSA) PRO, is a WordPress plugin that give you the ability to insert automatic links, based on keywords, in your site.Unlike the existing plugins, it simulates human behavior in links creation, avoiding to link exactly the keyword, but randomly(before or after) inserting in the links the words adjacent to the keyword. Google ranking is penalized by linking more times exactly same keywords. 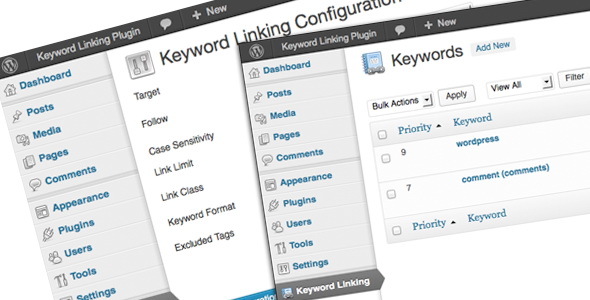 Keyword Linking for WordPress is a plugin helps you automatically convert to links from defined keywords in WordPress post to your own website page, or elsewhere on the internet. This is useful for improving internal cross referencing pages inside your site or to automatically link to external partner (SEO). Search Engine Optimization is the key for the websites to get real popularity and traffic. In the past years, the importance of social networks are hardly increased. The top search engines evaluates the websites for the aspects of backlinks and the social shares as well. The aim of this plugin to gathers all important data to one place including backlinks number, social shares, keywords density analysis and much more useful information to increase your website success in the challenge of websites. 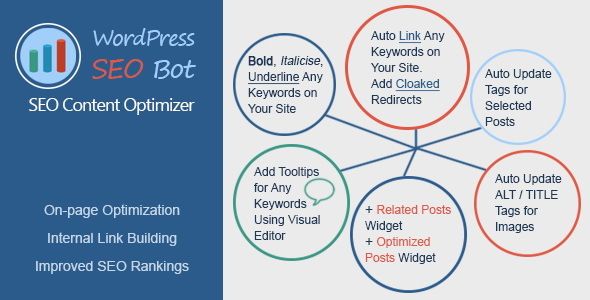 WordPress SEO Bot helps you optimize the content of your WordPress site for search engines. It is an essential tool for on-page optimization, internal link building, affiliate link building, keywords and tool tips management. 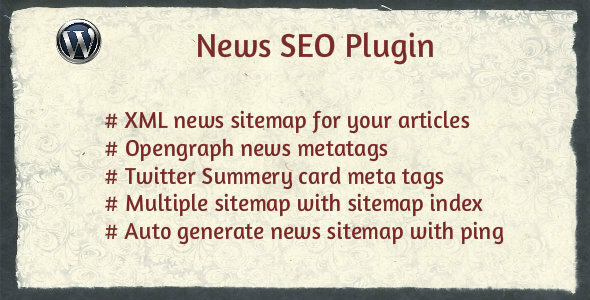 Plugin Create Xml news sitemap for you news articles,twitter news summery card meta tags , open graph meta tags for your news articles. Automatically or manually generate news xml sitemap whenever new article is updated. Automatically or manually Ping sitemap whenever news article is created.Multiple sitemap feature for sites with more then 1000 articles. SEOBudd is an all-in-one tool to research your keyword density and view keyword search visits. Track your incoming keyword search visits and the percent change. 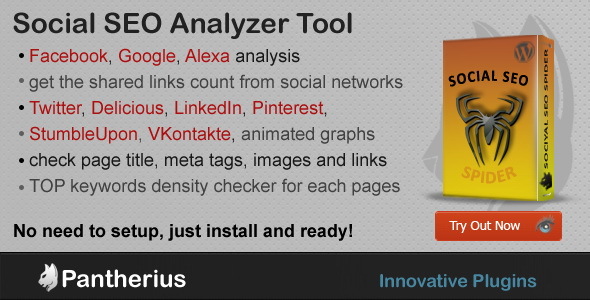 Now you can target your most popular keywords with ease. 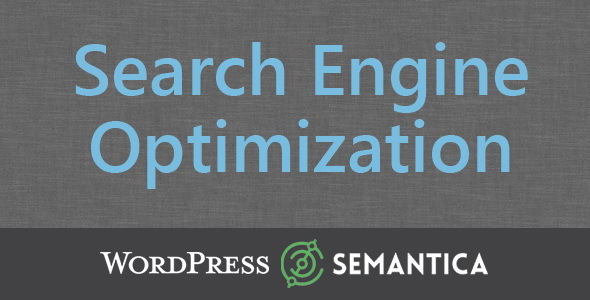 WordPress plugin for Search Engine Optimization. It sets the h1, extra text blocks, titles, keywords and page descriptions (with using templates). It adds item to the main WP control panel menu, forms of editing and adding new posts, editing taxonomy extra columns for setting SEO-parameters to the certain pages.